The most important building in Sephardic architecture is the synagogue. The synagogue had become very important in Jewish life, after the destruction of the Beth HaMikdash in Jerusalem, as a meeting point of jewish worshippers. During our Jewish Toledo Tour, you will notice that the two synagogues are the most important stops of our guided visit. In the end of 14th century, the Christians attacked all Sephardic communities and destroyed almost all the synagogues, as well as the rest of Jewish life of Spain. Before their destruction, their had been hundreds of synagogues in Spain, but today only eighty remain. Of these, only three exist without major changes. There are two in Toledo, María la Blanca and La Sinagoga del Tránsito , and one in Cordoba. All of the synagogues these survived to the present day were were used for different purposes or converted into churches. 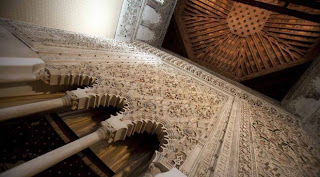 In María La blanca synagogue of Toledo, there the strange ring on the wall which is not compatible at all with the original architecture of the building and it is said that it was used by the soldiers of Napoleon to tie their horses. When they were in use as synagogues, many of the buildings were ornamented with inscriptions in two or three different languages. The constitution of these synagogues, with a great hall, oriented towards Jerusalem and an arc, containing the Torah scrolls, is visible in contemporary synagogues of today. There is a grand hall, whose wall is positioned towards Jerusalem; an arc holds the Torah. In front of the Arc is an elevated reading desk, for reading the religious texts, which in the Sephardic tradition was usually in the center of the hall. Seats for the worshippers surround the reading desk and there is an oil lamp lit, at all times, somewhere. The women have a another, reserved space to worship, generally on an upper floor and covered by a latticework. During our Jewish Toledo Tour you will be amazed by the fascinating wall of the Synagoga del Tránsito. Even though it took almost century to be built, it was inaugurated in 1,180; and it is a beautiful example of Toledan mudejar style architecture. It has five wings separated by twenty eight horse-shoe arches that fortify brick columns covered with cement and painted with limestone. The handcrftship was done of European larch, the altars are plateresc, the gates are mudejar, and the boards are of Berruguete's school. The destruction and conversion of Sephardic synagogues symbolizes the end of Jewish welfare in Spain. Jewish life became insecure after 1391, and after the expulsion of 1492, all of their properties were confiscated either by the monarchy or the church. To schedule a nevertobeforgotten private walking tour in Jewish Toledo with a shomer mitzvot jewish guide please send us a message via our contact form. Please visit and feel free to share our web page www.jewishtoledotour.com with your friends!